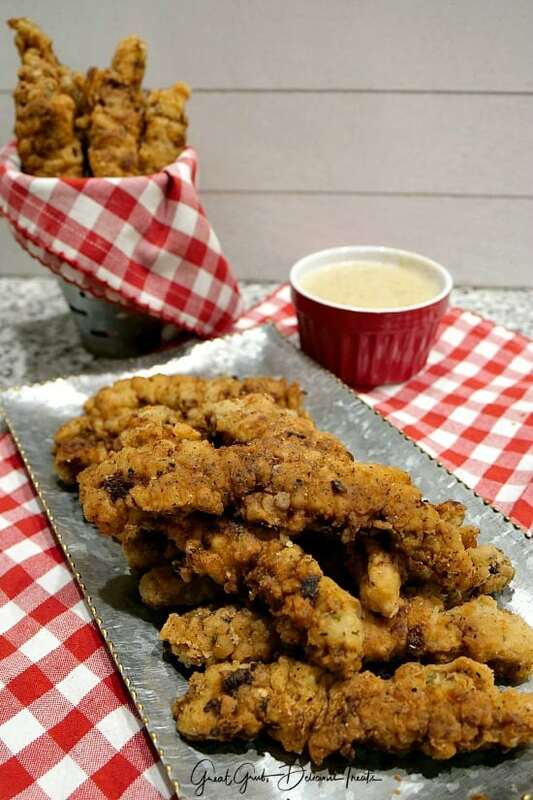 Chicken fried steak is one of my all time favorite comfort foods and these delicious chicken fried steak fingers are right up there as an all time favorite as well. Each steak finger is deliciously flavored, with just the right amount of seasoning, then fried to perfection and are super crispy and incredible tasty. 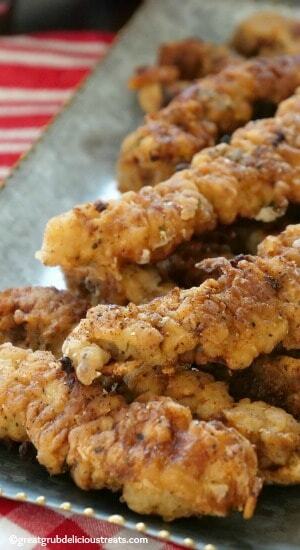 These steak fingers are so tender, and crispy, and then when dipped into country gravy, my oh my, absolutely delicious! 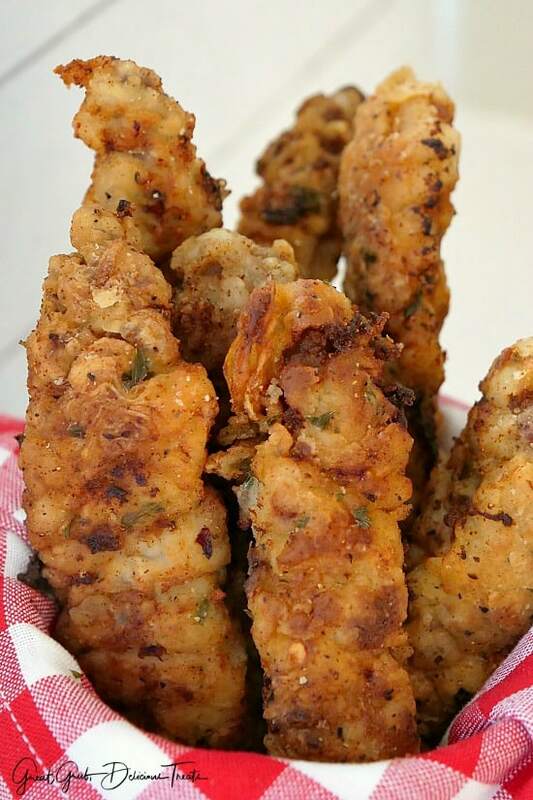 With all the different spices, these chicken fried steak fingers are slightly spicy. Not too much but just enough to give these fingers such amazing flavor. Trust me on this one, all the spices used in this recipe are the reason these steak fingers tastes so scrumptious. 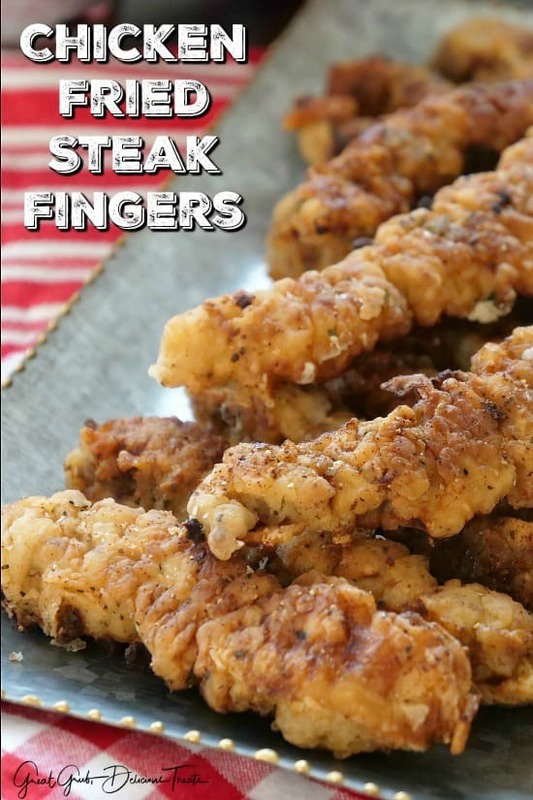 This steak fingers recipe is absolutely scrumptious. I was asked by my son-in-law to make these chicken fried steak fingers for dinner last night for a few friends and especially for a friend who flew in from Colorado. 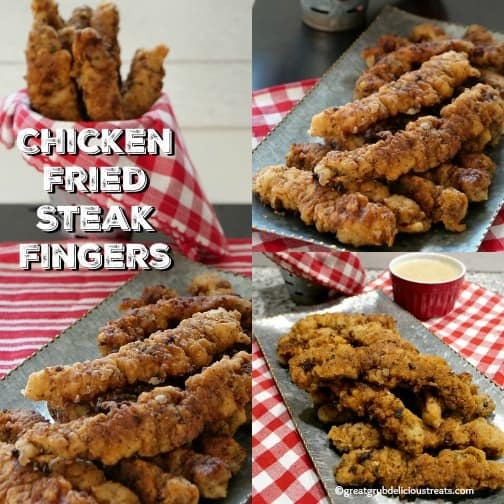 My daughter, Nikki and son-in-law, Justin, just moved into their new home and are having a house-warming party later today and because they love this recipe so much, wanted to serve it to their friends also being that chicken fried steak is one of their friend’s favorite all time foods, I agreed. 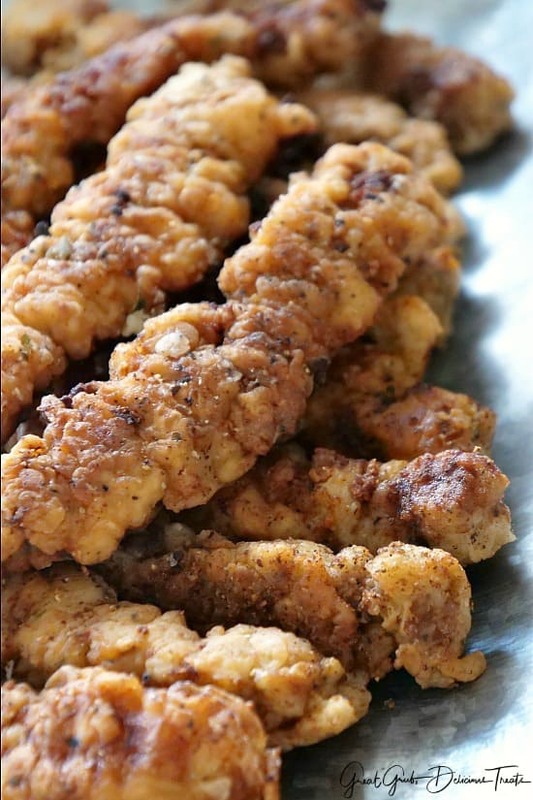 But before they could enjoy these delicious chicken fried steak fingers, I had to snap a few photos so I could share this delicious recipe with all of you. 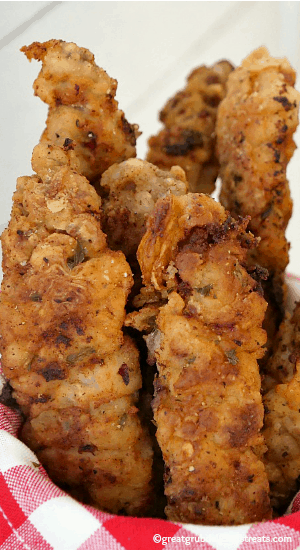 Super crispy, super delicious and flavorful, these chicken fried steak fingers are a family favorite. Requested often, this is one of our favorite meals to enjoy with friends and family. 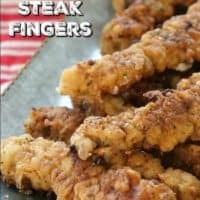 These steak fingers are a perfect finger food recipe, a favorite appetizer recipe served with a country gravy dipping sauce, and an incredible recipe served with mashed potatoes and gravy. So versatile. Just look at these tasty steak fingers. Incredibly crunchy, the double flour coating, along with the buttermilk egg mixture, is what gives these steak fingers that amazing crunch. 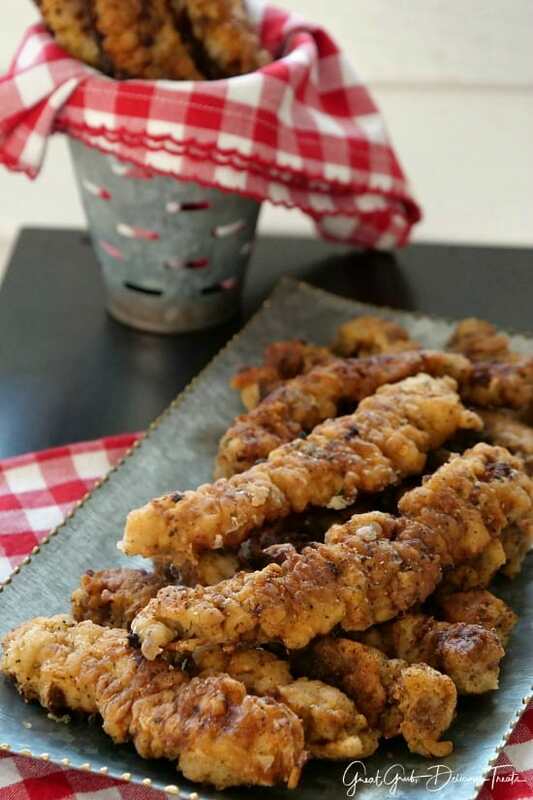 So grab some cube steak from the local grocery store and enjoy these delicious chicken fried steak fingers today. This will fast become a family favorite with your family too. Here are a few more delicious comfort food recipes you can find on the blog: Cheesy Ground Beef Pasta, Salisbury Steak in Mushroom Onion Gravy, Chicken Fried Steak with County Gravy, Fresh Peach Cobbler, and Easy Cherry Cobbler plus many more. Cut cubed steaks into 1 inch strips and place on plate lined with paper towels to soak up excess liquid. As you cut steak into strips and fill the plate, add another layer of paper towels and continue stacking fingers with paper towels in between layers to absorb excess liquid and pat dry. While the oil is heating up, add half the flour into a large baggie then prepare 2 different bowls that are big enough for the steaks. The first bowl has eggs and buttermilk whisked together, and the second bowl has the other half of the flour mixed with all the seasonings. Once the oil is ready, pat dry and place about 6-8 steak fingers into the baggie with the flour, seal and shake to coat. Next add to the egg mixture, then into the flour with the seasonings, then into the skillet. Once the first batch is cooked, place on a plate lined with paper towels and place into a preheated oven at 175° to keep warm while the rest of the steak fingers are being cooked. Repeat the coating process for the remaining steak fingers. For best results, make sure to coat the steak fingers right before going into the skillet. My family enjoyed them, I think my husband will want me to make them more often.I didn’t even a get taste they both ate everything.I guess I will go to bed with peanut butter and jam.thank you for the recipe. Do you figure this feeds 6 people? I know some times people will eat more or less when foods are in different forms😁. These look so much like dish I used to enjoy at a local restaurant. They served theirs with a Texas pedal type sauce I am excited to try this it’s been a long time since I’ve enjoyed steak fingers!. What is Slap Ya Mama seasoning? I am a southern girl who now lives in Alaska and haven’t heard of it before. I want to make this but I only have round steak would that work? Pound the steak a lot since round steak is tough. Can these be air fried?